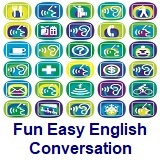 ﻿ Fun Easy English - new classroom free online classes english language lessons speaking listening writing reading april 19. 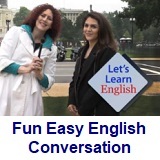 Today in the Fun Easy English classroom you are going to learn about copula verbs an important part of English grammar. Definition of a copula verb. Copula verbs are very difficult to learn. 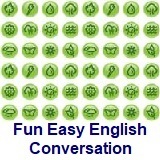 Note that the conjunction that introduces an indirect statement is often omitted in casual conversation. 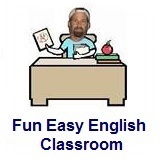 Much is a common intensifier for comparative adjectives and adverbs: much harder, much more difficult, much less useful, etc. A lot is also used for this purpose: a lot prettier, a lot more practical, a lot more expensive. The rising intonation indicates a true question, requiring an answer. 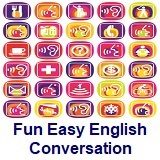 Meaning is I understand (why you like it). Becoming is an adjective meaning suitable in appearance; having an attractive effect. Meaning is in that case; since that is so.